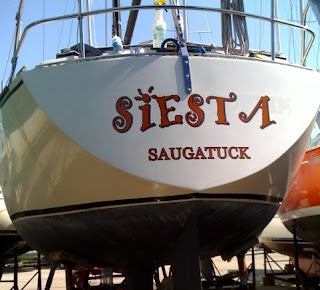 Here's the recently re-christened Siesta... couldn't be happier with the outcome. Launch later this week... looking forward to a great summer (and perhaps an occasional afternoon siesta). Wouldn't you like to be a happy Custom Boat Names customer? It's easy... Simply visit Custom Boat Names and start designing your boat names now.